Reminder – Ward 7 Education Council Meeting Today! Join us for a briefing on what’s in the FY 2014 budget for schools and learn how you can affect this process. A representative from DCPS will be available to take your questions. 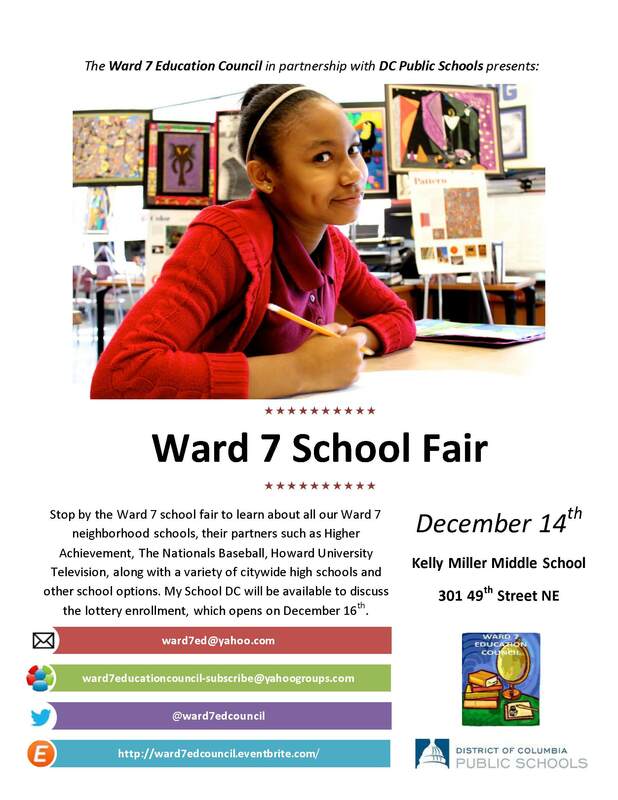 To help us prepare, please email us your questions at ward7ed@yahoo.com. Last month despite community and stakeholder outcries, Chancellor Henderson decided to move forward with a plan to close 15 DC Public Schools. This decision does not solely affect the close to 3000 students who will see their neighborhood schools close as a result, but rather it affects all of us. These closures impact the health and landscape of our neighborhoods, impacting our property values, voting precincts, meeting locations, and educational options for both current and future parents. The Ward 7 Education Council passed a moratorium supported by Ward 7 Parents, PTAs, our Ward 7 Councilmember Yvette Alexander, Ward 7 SBOE Representative Karen Williams, the Ward 7 Democrats, numerous ANCs, and most importantly YOU!! !